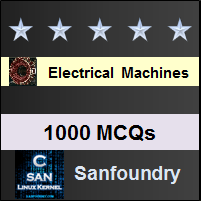 This set of Electrical Machines Multiple Choice Questions & Answers (MCQs) focuses on “Elementary Synchronous Machines”. 1. Consider a single phase synchronous machine of cylindrical rotor type. A single phase supply is given to the stator winding and a voltmeter is connected across rotor winding. For what value of θr, the voltmeter reads maximum? Explanation: When θr=0, the flux linkages with the rotor are maximum, and this is indicated by a maximum voltmeter reading. 2. Consider a single phase synchronous machine of cylindrical rotor type. A single phase supply is given to the stator winding, and a voltmeter is connected across rotor winding. For what value of θr the voltmeter reads a zero? Explanation: When θr=90°, the voltmeter reading is zero, because the stator winding axis is perpendicular to the rotor winding axis, and the mutual inductance Msr is zero. 3. Which of the following equation best represents the mutual inductance between stator and rotor in a single phase cylindrical rotor synchronous machine? Explanation: In a single phase cylindrical rotor synchronous machine, the Msr is maximum, when θr=0, and is zero when θr=90° and cosine function represents it. 4. In a single phase cylindrical rotor synchronous machine, the torque Te tends to ____________ the space angle θr. Negative sign indicates that the torque Te tends to reduce angle θr. Explanation: The torque expression is applicable whether the rotor is revolving or stationary. Explanation: Constant and equal, as the reluctance offered to the fluxes produced by phase α and β winding doesn’t vary with rotor movement. Explanation: Since the axes of phase α and phase β windings are normal to each other and air gap is uniform, the mutual inductance Mαβ between α,β winding is zero. We can observe that it remains constant at every instant of time. 9. Which of the following equation represents the reluctance torque of a salient pole synchronous machine? If field current If is reduced to zero, the reluctance torque Te(av)= 1/8 Im2(Ld-Lq)sin2δ. 10. Which component of torque equation, Te(av)= 1/8 Im2(Ld-Lq)sin2δ+1/2 IfImMmaxsinδ represents the electromagnetic/interaction torque in single phase salient pole synchronous machine? Explanation: The torque developed by the interaction of both stator and rotor magnetic fields is the electromagnetic/interaction torque. Explanation: Te(av)= 1/8 Im2(Ld-Lq)sin2δ+1/2 IfImMmaxsinδ = Asinδ+Bsin2δ. 13. The self and mutual inductances of a doubly excited magnetic system are Ls=0.6+0.20cos2θr H and Lr=0.75+0.30cos2θr H and Msr=0.8cosθr H. For a stationary rotor at an angular position of θr=60°,what is the magnitude of torque when the currents is=20A DC and ir=10A DC? Substituting the numerical values in Te= 1/2is2dLs/dθr+1/2ir2dLr/dθr+isrdMsr/dθr= -233.88N-m.